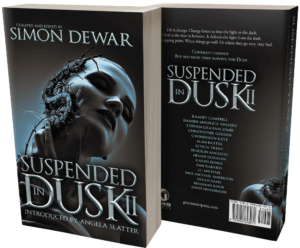 Over at the blog today, Nerine Dorman talks Suspended in Dusk II. 1. What was the inspiration for your SiD2 story, “That Damned Cat”? First and foremost, Poppy Z Brite. I love his lush, dark prose that takes time to engage your senses. Not so much about the story but the gooey essence of the world and the characters that inhabit it. I owe some debt to Clive Barker as well, though I haven’t read nearly enough of his writing as I’d like to – it’s more his worlds that have captured my imagination. Having a story published in an anthology celebrating his Nightbreed has been one of my publishing highlights. HP Lovecraft, as complicated as he is, is another huge influence on me – especially in terms of the defamiliarisation of his settings and the hints of primordial strange that sludges onto the pages. Even if his writing itself is quite cumbersome, it has some sort of enigmatic quality that I can’t quite escape. I’m going to add Neil Gaiman to the pile, even though strictly speaking he’s not a horror author per se – he has written some pretty dark fiction, and his Sandman comic books lean heavily on the genre at times. Lastly, there’s Algernon Blackwood. Specifically his story “The Willows” is one that I return to often – it’s an absolute masterpiece in building tension and where the environment itself becomes the antagonist. My go to is The Lord of the Rings by JRR Tolkien. I make no apologies. My favourite trope in a story is where the hero is faced with a choice of beating the horror at cost of his own life, or recognising the innate darkness within himself, and embracing it, and thereby being transformed by it to become more than human. Off hand, I’m thinking of that wonderful, cheesestastic film “Dagon” and its ilk. Currently, I’m plodding away at the first draft of a YA SF novel that’s best described as a mash-up of Star Wars and Dragonriders of Pern. Once again, I make no apologies. I don’t like limiting myself by genre. I’ve also got a hot date with revising and releasing some of my back list this year, my urban fantasy novel Inkarna, which will release with its sequel, Thanatos. And I’m also expecting edits back on a fantasy novel that’s currently sitting with one of my favourite editors – but I can’t make any announcements yet as nothing has been finalised. As always, I continue to curate the South African Horrorfest Bloody Parchment short story competition and anthology, which is a labour of love for me and offers an opportunity for fresh voices in dark SFF and horror an opportunity to shine. Nerine Dorman is a South African author and editor of SFF currently residing in Cape Town. Her short fiction has been published in an assortment of anthologies, including the Midian Unmade: Tales of Clive Barker’s Nightbreed; The Endless Ages Anthology for Vampire: The Masquerade; the Wraeththu mythos; and War Stories: New Military Science Fiction, among others. Her YA fantasy novel Dragon Forged was a finalist in the 2017 Sanlam Youth Literature Prize, and she is the curator of the South African Horrorfest Bloody Parchment event and short story competition. 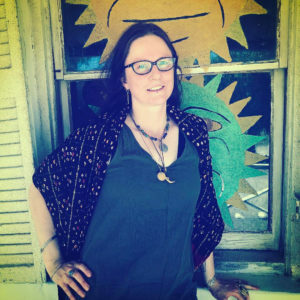 In addition, she is a founding member of the SFF authors’ co-operative Skolion. This entry was posted in News and tagged clive barker, f Star Wars and Dragonriders of Pern, Grey Matter Press, Nerine Dorman, nightbreed, Poppy Z. Brite, Simon Dewar, Suspended in Dusk II, The Lord of the Rings by JRR Tolkien. Bookmark the permalink.